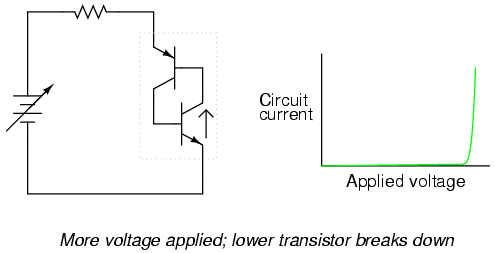 Thyristors are a class of semiconductor components exhibiting hysteresis, that property whereby a system fails to return to its original state after some cause of state change has been removed. A very simple example of hysteresis is the mechanical action of a toggle switch: when the lever is pushed, it flips to one of two extreme states (positions) and will remain there even after the source of motion is removed (after you remove your hand from the switch lever). 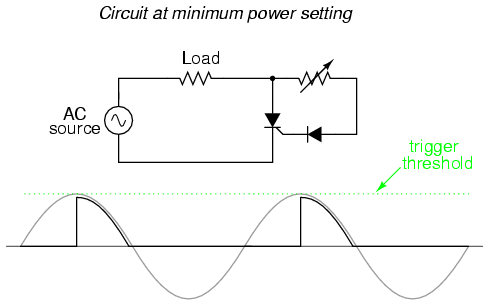 To illustrate the absence of hysteresis, consider the action of a "momentary" pushbutton switch, which returns to its original state after the button is no longer pressed: when the stimulus is removed (your hand), the system (switch) immediately and fully returns to its prior state with no "latching" behavior. Bipolar, junction field-effect, and insulated gate field-effect transistors are all non-hysteretic devices. That is, they do not inherently "latch" into a state after being stimulated by a voltage or current signal. For any given input signal at any given time, a transistor will exhibit a predictable output response as defined by its characteristic curve. 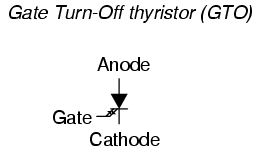 Thyristors, on the other hand, are semiconductor devices that tend to stay "on" once turned on, and tend to stay "off" once turned off. A momentary event is able to flip these devices into either their on or off states where they will remain that way on their own, even after the cause of the state change is taken away. As such, they are useful only as on/off switching devices -- much like a toggle switch -- and cannot be used as analog signal amplifiers. Thyristors are constructed using the same technology as bipolar junction transistors, and in fact may be analyzed as circuits comprised of transistor pairs. 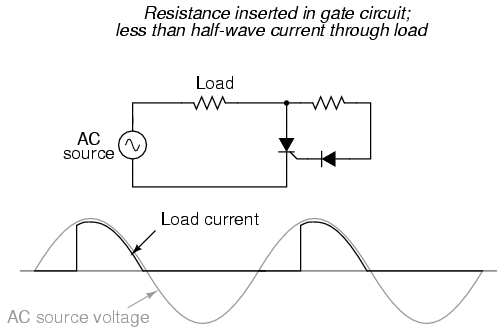 How then, can a hysteretic device (a thyristor) be made from non-hysteretic devices (transistors)? The answer to this question is positive feedback, also known as regenerative feedback. As you should recall, feedback is the condition where a percentage of the output signal is "fed back" to the input of an amplifying device. 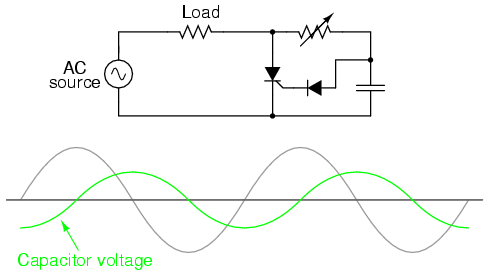 Negative, or degenerative, feedback results in a diminishing of voltage gain with increases in stability, linearity, and bandwidth. Positive feedback, on the other hand, results in a kind of instability where the amplifier's output tends to "saturate." In the case of thyristors, this saturating tendency equates to the device "wanting" to stay on once turned on, and off once turned off. In this chapter we will explore several different kinds of thyristors, most of which stem from a single, basic two-transistor core circuit. Before we do that, though, it would be beneficial to study the technological predecessor to thyristors: gas discharge tubes. In essence, thyratron tubes were controlled versions of neon lamps built specifically for switching current to a load. The dot inside the circle of the schematic symbol indicates a gas fill, as opposed to the hard vacuum normally seen in other electron tube designs. In the circuit shown above, the thyratron tube allows current through the load in one direction (note the polarity across the load resistor) when triggered by the small DC control voltage connected between grid and cathode. 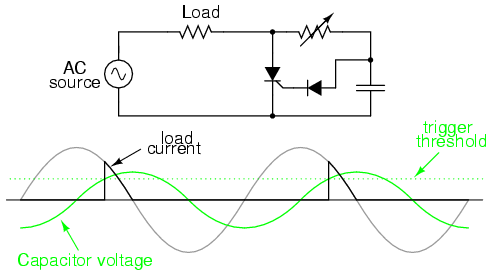 Note that the load's power source is AC, which provides a clue as to how the thyratron turns off after it's been triggered on: since AC voltage periodically passes through a condition of 0 volts between half-cycles, the current through an AC-powered load must also periodically halt. This brief pause of current between half-cycles gives the tube's gas time to cool, letting it return to its normal "off" state. 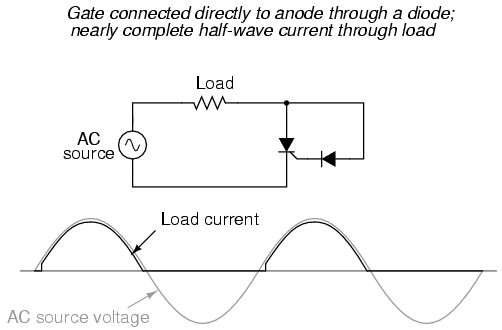 Conduction may resume only if there is enough voltage applied by the AC power source (some other time in the wave's cycle) and if the DC control voltage allows it. 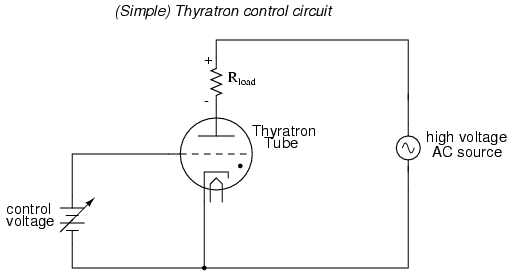 Although I'm not sure if this was ever done, someone could have applied the thyratron tube to a relaxation oscillator circuit and control the frequency with a small DC voltage between grid and cathode, making a crude voltage-controlled oscillator, otherwise known as a VCO. 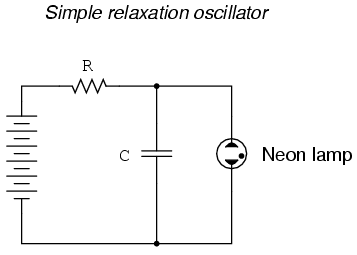 Relaxation oscillators tend to have poor frequency control, not to mention a very non-sinusoidal output, and so they exist mostly as demonstration circuits (as is the case here) or in applications where precise frequency control isn't important. Consequently, this use of a thyratron tube would not have been a very practical one. 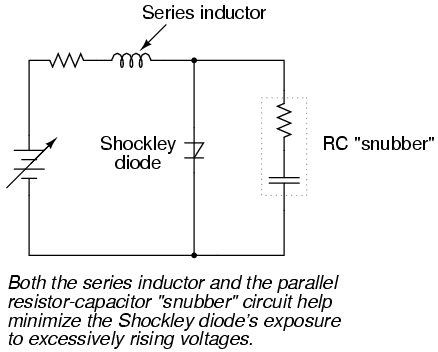 Put in simple terms, the Shockley diode tends to stay on once it's turned on, and stay off once it's turned off. 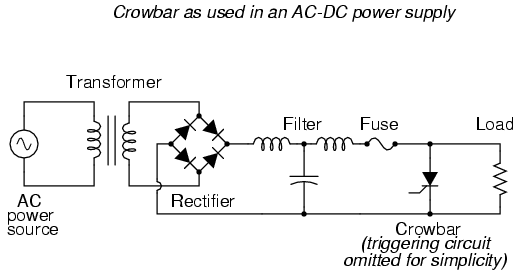 There is no "in-between" or "active" mode in its operation: it is a purely on or off device, as are all thyristors. 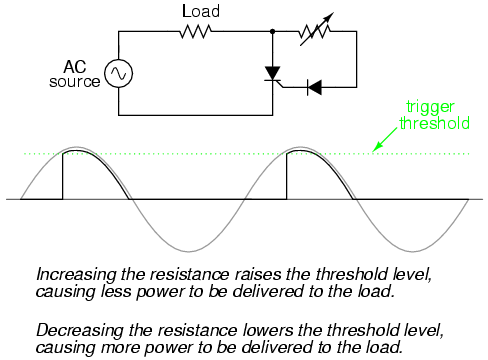 DIACs are almost never used alone, but in conjunction with other thyristor devices. Optothyristors (a general term for either the LASCR or the opto-TRIAC) are commonly found inside sealed "optoisolator" modules. When the "on" pushbutton switch is actuated, there is a voltage applied between the cathode gate and the cathode, forward-biasing the lower transistor's base-emitter junction, and turning it on. 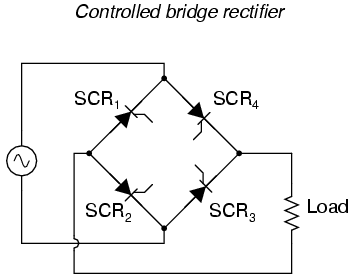 The top transistor of the SCS is ready to conduct, having been supplied with a current path from its emitter terminal (the SCS's anode terminal) through resistor R2 to the positive side of the power supply. 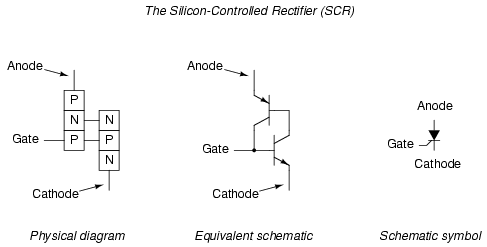 As in the case of the SCR, both transistors turn on and maintain each other in the "on" mode. 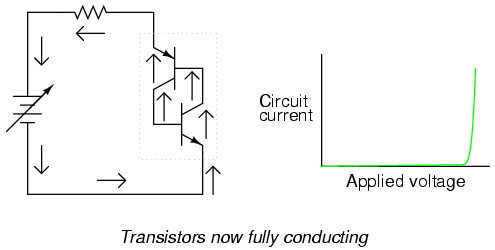 When the lower transistor turns on, it conducts the motor's load current, and the motor starts and runs. 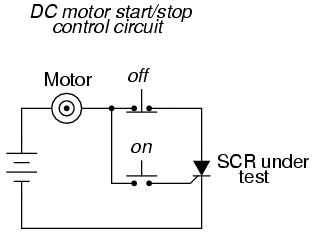 The motor may be stopped by interrupting the power supply, as with an SCR, and this is called natural commutation. 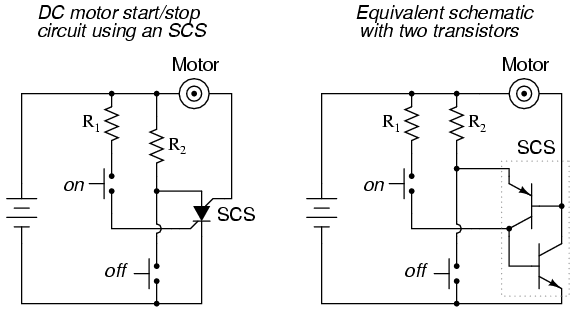 However, the SCS provides us with another means of turning off: forced commutation by shorting the anode terminal to the cathode. 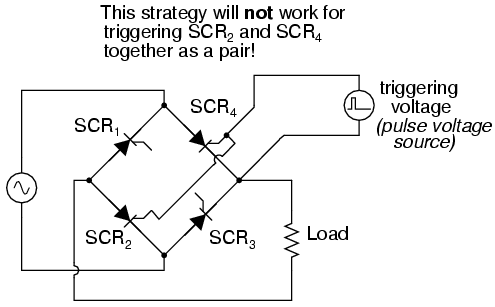 If this is done (by actuating the "off" pushbutton switch), the upper transistor within the SCS will lose its emitter current, thus halting current through the base of the lower transistor. 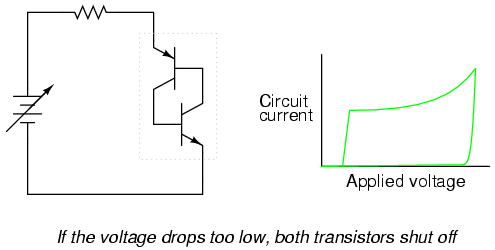 When the lower transistor turns off, it breaks the circuit for base current through the top transistor (securing its "off" state), and the motor (making it stop). The SCS will remain in the off condition until such time that the "on" pushbutton switch is re-actuated. 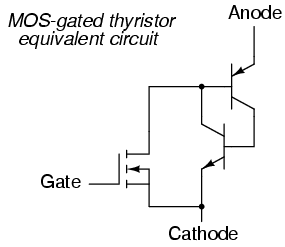 Two relatively recent technologies designed to reduce the "driving" (gate trigger current) requirements of classic thyristor devices are the MOS-gated thyristor and the MOS Controlled Thyristor, or MCT. 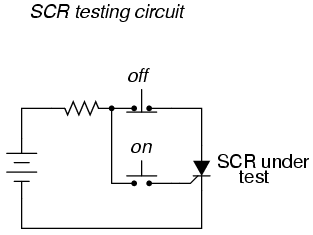 Given the fact that ordinary SCRs are quite easy to "drive" as it is, the practical advantage of using an even more sensitive device (a MOSFET) to initiate triggering is debatable. Also, placing a MOSFET at the gate input of the thyristor now makes it impossible to turn it off by a reverse-triggering signal. Only low-current dropout can make this device stop conducting after it has been latched. 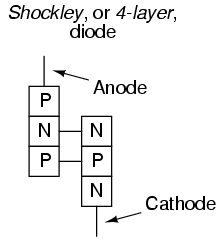 A positive gate voltage (with respect to the cathode) turns on the upper (N-channel) MOSFET, allowing base current through the upper (PNP) transistor, which latches the transistor pair in an "on" state. 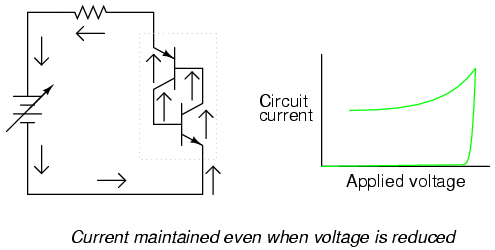 Once both transistors are fully latched, there will be little voltage dropped between anode and cathode, and the thyristor will remain latched so long as the controlled current exceeds the minimum (holding) current value. 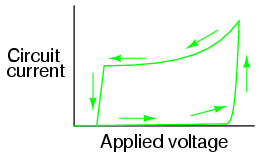 However, if a negative gate voltage is applied (with respect to the anode, which is at nearly the same voltage as the cathode in the latched state), the lower MOSFET will turn on and "short" between the lower (NPN) transistor's base and emitter terminals, thus forcing it into cutoff. 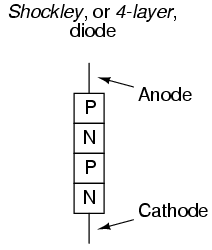 Once the NPN transistor cuts off, the PNP transistor will drop out of conduction, and the whole thyristor turns off. 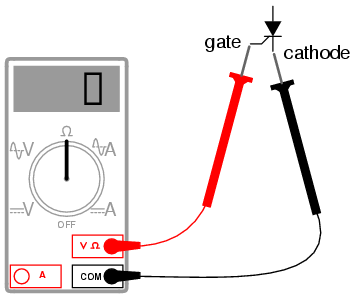 Gate voltage has full control over conduction through the MCT: to turn it on and to turn it off. This device is still a thyristor, though. 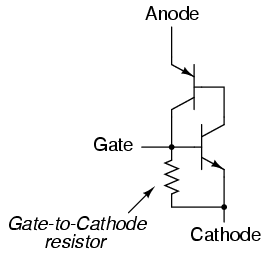 If there is zero voltage applied between gate and cathode, neither MOSFET will turn on. 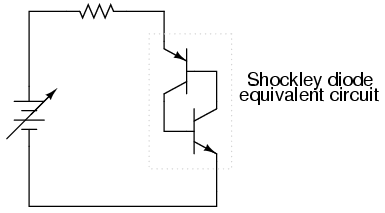 Consequently, the bipolar transistor pair will remain in whatever state it was last in (hysteresis). So, a brief positive pulse to the gate turns the MCT on, a brief negative pulse forces it off, and no applied gate voltage lets it remain in whatever state it is already in. 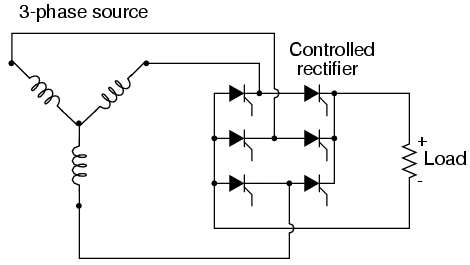 In essence, the MCT is a latching version of the IGBT (Insulated Gate Bipolar Transistor). 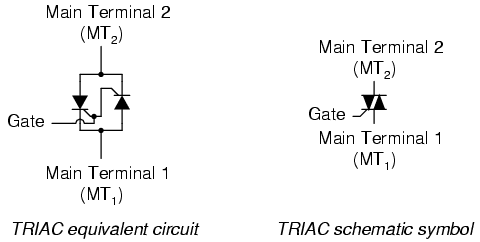 A MOS-gated thyristor uses an N-channel MOSFET to trigger a thyristor, resulting in an extremely low gate current requirement. 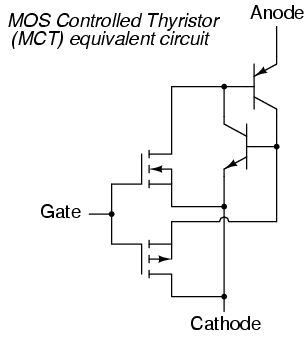 A MOS Controlled Thyristor, or MCT, uses two MOSFETS to exert full control over the thyristor. 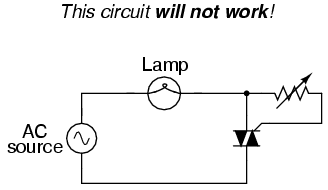 A positive gate voltage triggers the device, while a negative gate voltage forces it to turn off. 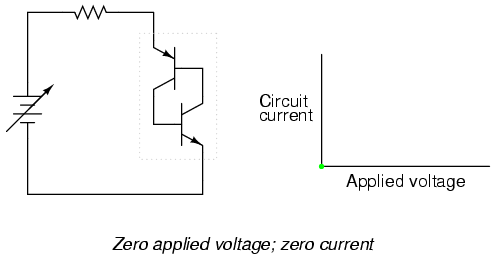 Zero gate voltage allows the thyristor to remain in whatever state it was previously in (off, or latched on).